Popular Chinese restaurant between K-Mart and Pasadena Plaza. Owned by the family of Dominic Ng, SoHo Class of 1968. Favorite ice cream spot on Edgebrook and after-school employer for many Trojans. One of the very few SoHo eateries from the Sixties still in business. Perhaps the most popular BBQ restaurant in southeast Houston. Favorite family and date spot. Catered to Trojan football team's pre-game meal needs. Owned by the Holcomb family. Twin Brothers Donnie and Ronnie Holcomb, Class of 1965, played for the Trojans and worked there. Thought to be one of the first Burger Kings in the Houston area. Located right across the street from K-Mart and very close to Pasadena Plaza. Hamburgers and hots dogs were inexpensive popular treats. Hot spot on the cruise scene in the last Sixties. Cars with surfboards on top in constant motion. Closed and the property redeveloped. Favorite to multiple generations of Trojans. Opened in the early Sixties, it lasted into the 21st Century. Great bike destination for kids growing up in Freeway Manor. Adjoining game room made it a popular stop for kids in high school and beyond. Many SoHo students worked there, including the fabulous Gooch sisters. Great food. Teen-friendly environment. As of 2014, only the sign remains. A popular alternative to Baskin-Robbins on Edgebrook. Popular coffee shop near the corner of Old Galveston and College. Still in operation. A favorite (along with Trainer's) of SoHo students in the late Fifties and early Sixties. Sterling, no longer on the map, is now the northside frontage road for Hwy. 225. 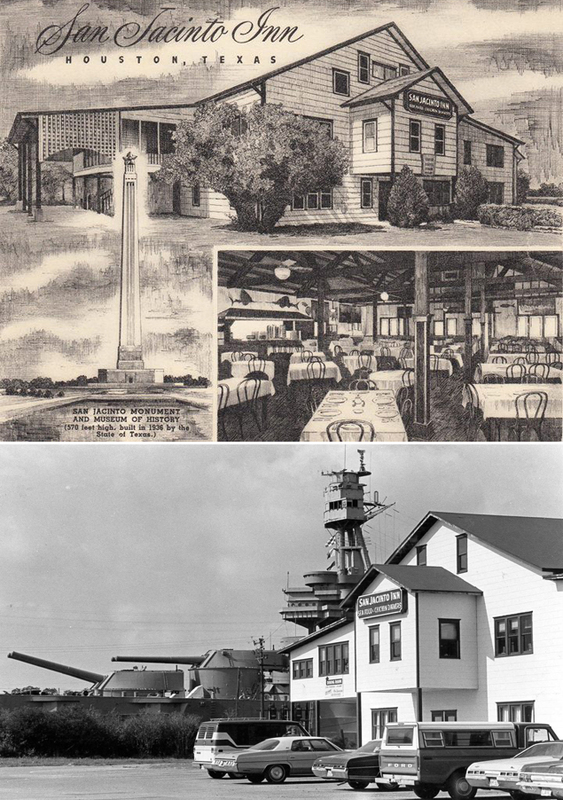 The Corral was located just outside of the old Sinclair Refinery (now Lyondell-Basell), about one-half mile west of Richey. High school students from Pasadena and South Houston would cruise Sterling from the Corral on the west end to Trainer's on the east end, which was right next to the Capitan Theatre, a favorite date destination for those who still had date money after cheeseburgers and cherry Cokes. "We Specialize in 5-Cent Root Beer." Favorite root beer stand for Pasadena and early SoHo students. Located about midway between the two schools. Located across the street from South Houston Junior High (Intermediate). Good food, but limited parking and seating made it more of a grab-and-go place. Owned by the father of Gary Moss, SoHo Class of 1970. Building is now home to Magic Burger. Popular dining on the water. A date staple for Trojan couples. Frequent and extended closings because of storm damage. Now part of Landry's on the Kemah Boardwalk. Ad slogan: "A favorite for dates and that after-game meal." Wildly popular destination for post-game eats. Packed with Trojans within 30 minutes after each game in the Sixties and into the Seventies. Football players in red blazers were always the most special guests. Jukebox played all the latest Top 40 tunes. Pizza was superb. "The Yoint" was just as well known for its black lights and fluorescent frescoes of Italian landscapes. Popular first-date diner for young SoHo teens. Younger and older students blended perfectly. Lasted into the Eighties. Advertising the "Snack That Brings You Back." SoHo's first great hangout, the Ritzee was known for fine food, family fare in the afternoon and early evening -- and a somewhat notorious reputation as a raucous teen hangout after dark. A celebrated cruise spot and the scene of many rumbles. Under almost constant surveillance by SoHo police. Pasadena and South Houston's first drive-in outlet on the Gulf Fwy. Drive-in limped into the Seventies. Later, an equipment rental store. Various structures have been erected on its foundation. A Houston dining tradition for four decades. Popular spot for family dining. Closed in 1987. Quieter alternative to many of the "crusing" spots in the Sixties. Known for good service and excellent food. Popular "to-go" spot for residents in the Avenues and Arlington Heights. Building has housed many used-car dealers since the final burger was flipped, probably in the early Eighties. Favorite burger and ice cream stop for kids living in old South Houston and the Avenues. Part of the tradition of South Houston Little League and the community pool located on 7th Street, just a couple of blocks south. Kids would flock to Tom's for post-game treats or after a day at the pool. Popular refreshment stop for high-schoolers, as well. Located close to the intersection of Tatar (now Pasadena Blvd.) and Hwy 225, adjacent to the Capitan Theatre. Sterling is now the northside frontage road for 225. Trainer's was the eastern anchor for the Sterling cruise trip. The Corral Drive-In was on the west end. 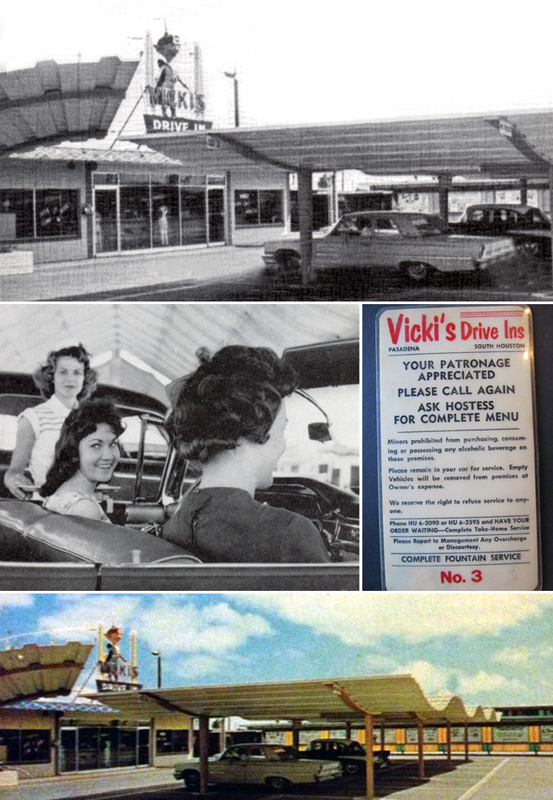 Vicki's Drive-in and adjacent La Fronda Motel were owned by the Vickery family, whose kids went to SoHo. A favorite stop on Old Galveston, about halfway between old Pasadena and the growing SoHo stomping grounds. Famous and much admired for its "Martian and flying saucer" outer space motif. This was one of two Vicki's. The other one was at the corner of Spencer and Shaver.